Believing Thomas: Hey Church, You Lost Me! Part 4. We'll look at three today. 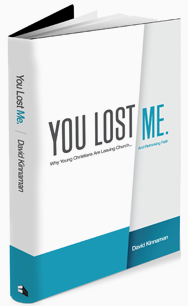 Kinnaman offers "the turn" for each description, offering "suggestions to help young dropouts turn their reason for leaving into a hunger for deeper faith, and to help us in the church's older generations turn our frustrations and occasional feelings of failure into renewal." Christian overprotectiveness can lead to youth and young adults seeking alternate thrills, "failing to launch," becoming paralyzed with self-doubt, and to the church's loss of young creatives. "A growing sentiment of this generation is that they want to be...a counter-culture for the common good...they want to be culture makers, not culture avoiders." Kinnaman suggests that we turn from ministry quantity to quality and cultivate apprenticelike training to help the next generation discover what they are gifted for and called to do, and do all we can to nurture that calling. "I believe we need to change from an industrialized, mass-production, public-education approach and embrace the messy adventure of relationship." A 2009 Barna research poll showed that 52% of youth group teens aspire to science-related careers while only 1% of youth workers have addressed issues of science in the past year! "We must rethink our efforts to teach young people what to think about issues of science, ethics, politics, and even theology and consider how we can help them learn how to think...we must prepare them for careful, prayerful, collaborative reasoning with Christians and non-Christians alike." It seems to me that each of these three descriptions are forms of over-protection. Shallow worship and ministry protects against the "frighteningly real" intimacy of relationship, and suppresses real, but "impious" feelings - doubts, anger, despair. The antiscience mentality seeks to protect our minds instead of engaging our God-given reason in conversation and exploration of the nature of God's work in creation. Next up we'll look at repressive, exclusive and doubtless.